Hate to say it but buy this comic for the artistic direction and ignore the rest. So today I am looking at an indie comic called “The Fog Walkers”. This is one of the more painful reviews I have had to do. It is a downright dream in terms of art but everything else falls so flat. In short, I REALLY want to love this comic but I just can’t. That being said, I lets jump into the good stuff first. Fog Walkers takes a different spin on art. They are using photos rather than illustrations and it WORKS so well. The tone and style is something this comic has down pat. They have a heavy filter over their black and white pictures which blends the line between illustration and photograph. It is gritty and dark and lonely and it perfectly matches the aesthetic they were going for. It’s a risky gamble that pays off. I’ve seen other comics that have tried to do something this but it ended up looking like terrible clip art (generally traced with Illustrator). Add to that the fantastic and creative page layout, where they extend characters beyond the panel edge to look at images in other panels, and this is one of my favorite comics visually thus far for 2014. One thing that bugs me about this comic is the lettering. Hands down the worst I’ve ever seen. It might be a technical glitch but the lettering has odd spaces and occasionally will separate a letter or two out from the rest. I don’t think it was done for tone or style, and if it was- it fails to convey anything other than “this comic is hard to read”. They use a spidery thin font and made me strain my eyes to read it on occasion and the jumbled mess that was their spacing just compounded the problem. The plot, unlike the fantastic artwork, is lacking as well. We hop on the exposition express in the first two pages. The dialogue is stale and doesn’t sound human and not much progresses in the first comic. We have a guy who is fighting aliens who have conquered the planet. A fog they need to survive has mutated some humans and they fight back against the aliens. 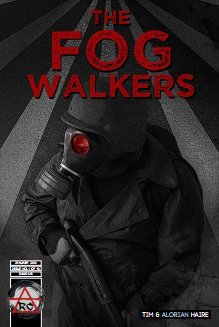 Our protagonist is a “fog walker”. It’s a really interesting premise that doesn’t really go anywhere in issue #1. That is not to say that a first issue has to go somewhere and I was actually pretty interested in the setting. However, I didn’t care all that much about the character or his situation. It seems like there were more interesting stories that could be told in this world unless I am missing something. Where is the twist? Where is the passion? Where is the intrigue? The first issue comes a guy putting on some cloths and leaving his shelter for a city where he kills something. It feels like it fell flat and honestly that is a shame considering the kind of love that went into the premise and downright gorgeous artwork. UPDATE: Having received an updated version from the publisher the quality of the lettering has improved significantly. It was a technical error on their behalf and they have amended it. The new lettering is still not superb. I would still suggest they do another revision on the kind of font they are using. The inconsistent character stroke and embellishment may play to the tone of the comic but it is a bit difficult to read (particularly with a black and white comic). I can admire the intent but the finished product is still a bit difficult to read. So Salvagers comes to us from Hound Comics who has a pretty good rep and I’ve been looking to check out a comic or two from them. I picked up Salvagers #1 and can’t wait to dive in. So these guys are pros. I read that comic without even blinking I think. 28 pages gone in a flash. Salvagers is about, you guessed it, salvage… but in space. At first it vaguely reminds me of the series planetes (If you haven’t seen that, stop reading this and treat yourself to an episode or two) but by the end the only things I could really liken it to were Firefly and Star Wars. A rag-tag crew of high-risk salvagers scour the stars for a few legitimate jobs. We join our crew as they are attempting to salvage a warship. When the ships security measures start kicking in, things go FUBAR. Don’t want to give anything away because it’s a solid comic but the real star of the comic is the characterization. The characters and their interactions with each other is a lot of fun to read and you can tell by the way they talk that they have been slumming in on these crummy jobs for a while now. The art is professional, no questions asked. Top notch grade A USDA approved comic art. The color and proportions were consistent, the dynamic action spot on, and the perspective creative and indicative of the action. If there is one complaint I can make it is the lettering, it switches for various reasons (com chatter, synthetic voice, etc) and sometimes that is for the worse. A few times the type got kind of close to the edge of the speech bubble and I really felt like it wasn’t on the level of the awesome art this comic has. Sorry for the short review this time, but I don’t have a lot of critiques for this one. Love it, go check it out. It’s gothy and emo but it has amazing art and prose. Alright next on my post-hangover 2014 review binge is Allwënn: Soul & Sword. It’s the preview for an upcoming comic series and it is hella free so that’s a plus right there (no excuse as to why you can’t “buy” it right?) Again, as per normal I didn’t read anything on this one prior to jumping in so let’s see how it did! …only I totally did read up on it and there was this YouTube video the creators did so I watched that before reading the comic. The tone I got from it was that of an anime series that takes itself way too seriously and tries to be “dark”. So consider this section a kind of mini review of the comic’s promo video. The intro text was very… weak. It was a bunch of emo vague statements over some cool music than a montage of artwork from the comic. Honestly, it conveyed tone but did not interest me. The art alone got me invested but the weak and vague statements didn’t tell me anything about what this book I would be buying would be about. Something about how the narrator (who is unknown to us) “was there” when a sword was baptized in “her” name and when he tried to kill himself. (Sigh) I really hope this comic’s story explains or I am gonna be ripped. Anyway, on to the comic! So first off this is not so much a comic as a true “graphic novel”. I don’t mean in the “serious comic” sort of way, but in the layout of the comic. It is a series of pages with dialogue over them with art in the background. Sometimes there is no art and just a stony black background. The art of this comic is beyond captivating. It fits the tone, it expresses emotion, it backs the dialogue, etc. In fact this book is nothing if not artistic and I say that because every visual aspect of this comic was design from the perspective of an artistic mindset. When there is art- it is a choice to do so that makes the story stronger, when there is no art- there is a aesthetic reason behind it, and the type of art (linework, full body, etc) it is all back by a solid rationale that I can understand. The background are beautiful too. Even when just a blackish stone texture it feeds that visual tone the comic is striving for. It feels a bit like a Conan story set in a high fantasy setting visually. Kind of remind me of Skyrim’s take on fantasy and I am impressed to the nth degree. After I finished this review I read another and it talks about how there are a few reused pieces in the comic but ultimately I find this acceptable. When they use the picture more than once, the first time we see only part of it and as the story unfolds, we see more of it. I’m sorry to say that the plot is just straight up “emo”. As a reviewer, I like to use better words than “emo” but it’s the most fitting one I can think of. The protagonist acts like he is going to kill himself every night by holding a dagger to his chest but stops and is always seeking his own death. Really? REALLY! That is the plot you are going for with art as goddam GORGEOUS as this? That is the tone you are going to use for a graphic novel laid out as well as this with as much love as was so clearly put into this? We get to hear the goth kids from South Park’s backstory for their D&D character? Ugg. Kill me now… except don’t. I don’t want to be as emo as this comic’s premise. The premise, as far as we are really told is that this a half elf half dwarf guy loves this girl… a lot. Like a lot a lot (we are told about it on just about every page) and since he couldn’t have her he went 120% emo and started seeking his own death by doing stupid stuff like trying to kill 20 people at once. Of course since he is the protagonist- he can’t die and keeps on going around repeating his suicidal quest. The writing itself is solid. No grammar mistakes, no odd word choices, and overall is brilliant. You have to get past all the gothy-emo stuff that is just laid on so thick and heavy it hurts at times. It reads more like poetry or limerick than story and you have to read between the lines quite frequently. The writing style reminds me of a Homeric epic at times while at others I find little snippets of The Bard in there. There is a particularly vivid love scene that we get one (tasteful) picture of but are then given a powerfully moving bit of prose that would make even a salty maiden blush. One thing that kind of bugs me, but I can totally see why they did it, is that they tell this story in such short fragments. It jumps around every four or five pages and I am unable to follow any one trail for more than a moment before the graphic novel jumps to something completely different. It was really hard to get through the first few “chapters” (which are only a few pages long) but around the midpoint it started to all click. There is an overall narrative that begins to take shape but since the story is not told chronologically for the most part it is a tough read. 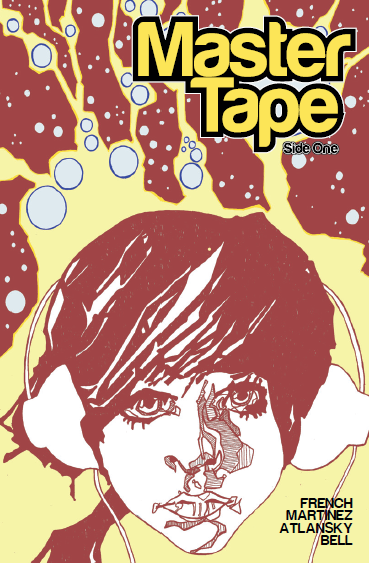 All and all this is one of those graphic novels you don’t want to miss. 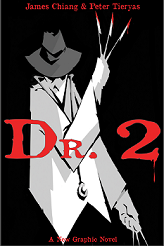 It’s a rare gem with greater prose and artistic direction that is second to none. The premise they chose is really dark and a little overplayed but the team that made this is wildly passionate about it and dives head first.